I remember few years ago when we had our first fight. It came out of nowhere that evening, i can't even remember what we were fighting for, temper were raised, hurtful words were traded, and neither of us held back to take caution. I was the chief fighter in the whole drama, lashing at her in anger without considering the weight of my words, nothing seemed to be making sense to any of us at that moment besides the points we were trying so hard to prove to each other, and you know how woman can remember things for Africa! After the drama she hardly said two words to me that day, our hearts heavy with pain. I knew i was wrong, totally my fault, plus i said too much in the fight, but i didn't apologize, oh yea i didn't, i was too proud mehn, you know how men have that little friction that opposes their ability to be humble before a woman? It's called "Ego", and it comes naturally. I kept my proud head so high, no call, no text, nothing! I did nothing to reach her, the whole day passed. "HI DEAR, I AM SO TIRED, PLEASE DON'T WAKE ME UP. I KNOW YOU'RE HUNGRY, ENJOY." To tell the truth, the plate of rice had already gone half way before i saw the note, i just descended on the delicious meal before somebody will just rush in and shout APRIL FOOL!! But after reading it i smiled like i was advertising for Pepsi, and the meat i was struggling to swallow refused to go down my throat. I was overwhelmed with guilt, i knew i was wrong, i knew i said too much, i knew i was too proud to apologize, but look what she did. "Love, i am very sorry for starting the fight, and for all i said. I was stupid, and i was wrong, i promise not to be too proud to apologize again, you have taught me a lesson on peace and humility i will never forget." Turns out she was only pretending to be asleep, probably waiting for me to start a season 2 of our fight, or humble myself and apologize. All she wanted to hear were those sincere magic words "I AM SORRY". 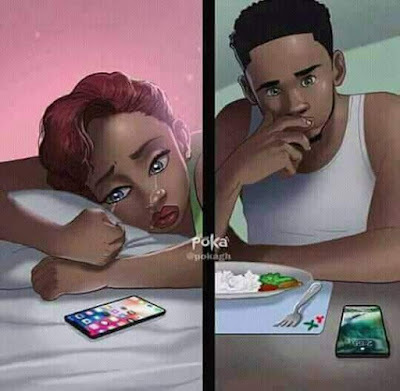 The point am trying to make you understand is; she took permission to get out of work early, dashed to the market with her own cash, came to my apartment, made me a meal, and waited for me to come home and be the man she fell in love with. Well, that shows how determined she was to make peace no matter who was wrong, how willing she was able to sacrifice, and how committed she was to make her relationship work. And if you ask me, i would say all of this shows that she was the one who apologized to me first without saying a word, she had already forgiven me before all the story telling apology i gave her beside the couch, I wasn't a superman for apologizing when i did, she was the SUPERWOMAN for making an effort towards peace. Please understand this guys, no relationship or marriage is rosy, there will be fights and disagreements a lot of times, but your greatest strength lies in how quickly you deal with those challenges. Do you stay a week without calling or texting? Do you spend months in malice trying to prove who was right and who was wrong? Do you ignore each others calls and efforts towards peace because of unforgiveness? Is there a reward for proving who was right? Certainly not! Why not be the first to apologize even if you were the last one to curse, that is the first and most important step to dealing with a fight.